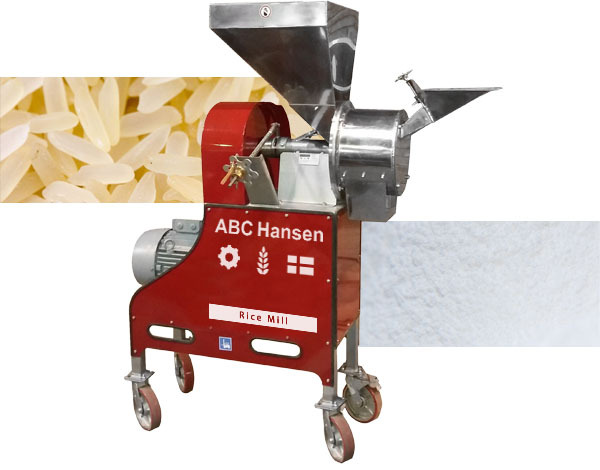 Rice flour milling machines for thickening agents and fine flour for the gluten-intolerant. Rice flour is normally prepared from broken rice kernels whether brown or white, which is separated from whole rice after polishing away the husk. (This equipment is also available from ABC Hansen.) A stone mill is a good choice to process rice flour which should be very fine. It is recommended to screen out all coarse particles prior to packing as rice flour should be fine and not gritty when rubbed between the fingers. Rice flour is may be used as a thickening agent in preparing soups, stews and other gourmet cooking. Rice flour is particularly used for refridgerated and frozen products as it inhibits separation of liquids. It is also used in baby food formulas and other sensitive powdered products and is often used as a substitute for teff flour when preparing traditional Ethiopian pancakes – especially among the Ethiopian diaspora. It is also widely used for extruded snacks and bread as substitute for wheat flour. Confectionaries often has rice flour as basis. Noodles and desserts such as mocha in Japan and cascaron in the Phillipines and pirinc unu in Turkey are other examples. Indian cuisine offers rice cakes, and Kheer. Another use of rice flour is to mix it with vermiculite as substrate fpr cultivating edible mushrooms in a low cost fashion. Rice flour is also used in cosmetics. Organic rice flour is normally milled with stone mills.